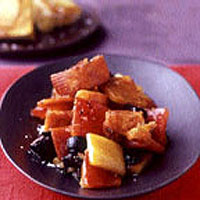 This colourful combination of roasted red and yellow peppers and black olives is served with paprika-stained croutons. These are inspired by migas, a type of tapas made by soaking chunks of bread in water then frying them to a dense, semi-crisp mass. Preheat the grill to high. Quarter and deseed the peppers, then lay them in a single layer on a grill pan, skin side up. Drizzle with 1 tbsp of the olive oil, then grill for 10-15 minutes until the skins are blackened. Put in a bowl, cover with clingfilm and leave for about 15 minutes until cool enough to handle. Meanwhile, heat the remaining oil in a frying pan, add the garlic and paprika and cook for about 1 minute. Add the bread cubes and stir well to coat them in the paprika-coloured oil. Fry over a medium-high heat for about 10 minutes until crisp. Remove the skins from the pepper quarters, then cut the peppers into 2cm squares. Place them in a bowl and add the paprika croutons and the black olives. Stir gently to mix and season to taste (you shouldn't need much salt as the olives are quite salty). Transfer to a serving dish and serve at room temperature.